Although Sir Isaac Brock was not born in Windsor, his 7 days spent in the Windsor / Sandwich area had a major impact on the War of 1812. Isaac was born on October 6, 1769 in St. Peter Port on the Island of Guernsey to John Brock and Elizabeth De Lisle. He arrived in Canada on August 25, 1802 and stayed here until his death in 1812. Even though he stayed in Canada for only 10 years, he had a major impact on the history of Canada. Sir Isaac joined the British army in 1785 by purchasing the rank of Ensign. He then purchased a posting of Captain, and signed up new soldiers to form the 49th Regiment of Foot. He gained some military experience while fighting off the coast of Copenhagen. In 1802, the 49th Foot was sent to Canada, and in 1803 they were stationed in York (Toronto). From 1805 to 1810, Brock spent his time improving the defences of Canada, especially in Quebec. In 1811, he was promoted to the rank of Major General. 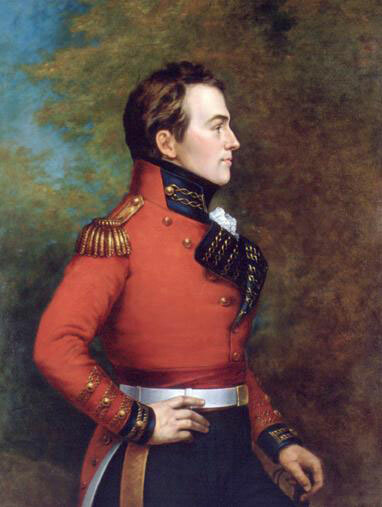 When the lieutenant governor of Upper Canada went back to England, Brock was appointed the administrator of the government of Ontario and the chief commander of the military forces. By 1810, there were rumours of war with the United States. On June 18th 1812, the United States declared war on Great Britain. On July 12th, Windsor was invaded by the troops of Brigadier-General William Hull, who was stationed across the river in Detroit. General Hull then advanced on Amherstburg to capture Fort Malden, but returned to Detroit while waiting for supplies and reinforcements. General Brock learned of the situation in the Western District (including Sandwich), and took some troops by boat to Amherstburg. He and his soldiers left York on August 6th and arrived at Port Dover on August 8th. They left by a flotilla of boats and, after a stormy voyage, reached Amherstburg on August 13th. The next day Brock met the great Indian leader Tecumseh. Tecumseh liked Brock and trusted him, and Brock believed that Tecumseh was a great man and a great leader. Brock convinced the Tecumseh that it would be in their best interests to join the British to defeat the invaders. After consulting with Tecumseh, Brock determined that the best course of action would be to attack Detroit immediately. On the night of August 15-16th, Brock’s troops crossed the Detroit River west of Detroit near the Rouge River. He also set up two gun batteries on the property of Francois Baby’s property in Windsor. On August 15th Brock sent a message to General Hull to surrender immediately, but this request was refused. On the 16th, bombardment began from the cannons on Francois Baby’s farm. The British soldiers and Indians on the American side advanced towards the fort. Brock made sure that General Hull and his soldiers saw all the soldiers, as well as the Indians, waiting to attack. Before the order to attack had been given, Hull raised the white flag of surrender. Brock had captured Detroit and the Michigan territory without having fired a shot. Brock returned to Kingston on September 4th, and proceeded to Fort George on the 24th. He was worried that the Americans would try to attack from across the Niagara River. His fears were well founded; in the early hours of October 13th, American troops crossed the Niagara River and climbed the cliff to attack Queenston. Brock heard the gunfire from Fort George and jumped on his horse to get to Queenston and lead the troops. While leading the second charge, an American soldier took aim and shot the general in the chest. While the American troops were re-assembling, a band of Mohawk Indians under the leadership of John Norton blocked their attack until Major General Roger Sheaffe arrived with reinforcements. The courageous actions of General Brock and the actions of John Norton and his Mohawks resulted in the defeat of the American army. Although General Brock was only in Essex County for a term of four days, his bravery and courage resulted in the capture of Detroit, and boosted the morale of the people of Upper Canada. For his efforts in the capture of Detroit, Brock was knighted, but died before word could get back to Canada. To honour one of Canada’s greatest heroes, the Parliament of Upper Canada commissioned a monument to be built in honour of Sir Isaac Brock. The monument was begun in 1824 and completed in 1827. It was severely damaged in 1840, and a new monument to replace it did not begin construction until 1852. A larger monument to General Brock was completed in 1859. The current monument is 56 metres high (185 ft) and there is a 235 step staircase in the column which leads to a small observation chamber. Berton, Pierre. The Invasion of Canada: 1812-1813. Toronto: Anchor Canada, 2001. Halpenny, Francess G., and Jean Hamelin, eds. Dictionary of Canadian Biography. Vol. 5: 1801-1820. Toronto: University of Toronto Press, 1983. Hitsman, J. Mackay., and Donald E. Graves. The Incredible War of 1812; a Military History. Updated ed. Toronto: Robin Brass Studio, 1999. Nursey, Walter R. The Story of Isaac Brock, Hero Defender and Saviour of Upper Canada, 1812. Canadian Heroes Series. Franklin, Tennessee: Upper Canada Press, 2011. Suthren, Victor J. H. The War of 1812. Toronto: McClelland & Stewart, 1999. Turner, Wesley B. The Astonishing General: The Life and Legacy of Sir Isaac Brock. Toronto: Dundurn Press, 2011.